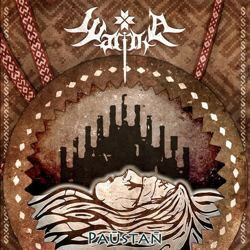 Wartha is a Belarusian epic folk pagan metal band from Minsk. They were formed officially in 2008 and the first years of their existence they have tried to find their own personal style and musical direction. Their first 2-track demo “Хороводы” was out in 2009 and it had a melodic folk black metal aesthetic. In 2011 they released the single “Zorny Šlach” redirecting their sound to a more folk pagan metal approach. The band had several line-up changes and financial difficulties, so they delayed a lot to release their debut album “Paŭstań“. It was recorded since 2010 and mixed in 2011, but they managed to release it on March 1st, 2013 after signing to Stygian Crypt Productions. Their music is pagan folk metal with male and female vocals, but not the typical Slavic pagan folk metal. They are combining the Belarusian culture and folk music with melodic synth-based blackened metal in a quite original result. In my opinion their production and sound need more work, since they don’t sound very powerful and natural. On the other hand, their compositions are very good, full of beautiful original ideas and a great balance between folk metal and extreme melodic metal. They use several traditional instruments in their music (can’t tell if they are real or samples) and many keyboards that result in an almost symphonic sound. Like most bands of the genre, they combine clean and brutal male vocals with Alice’s female vocals. And while Oleg’s vocals are very good and diverse, ranging from epic clean folk singing to extreme black metal screams, their female vocals need a lot of improvement. The contradiction with the male vocals is very good in terms of composition, and Alice has a very different and distinctive voice, but her singing sometimes sounds strange to my ears. “Paŭstań” includes 11 songs with a total duration of 46 minutes and the last of them is a great cover on Immortal’s “Błašyrk“. All of their lyrics (including the Immortal cover) are in their native language dealing with nature, Belarusian history and fantasy. “Paŭstań” is a very interesting debut from a band that is still searching its identity. After this album, they had more line-up changes and they recently released the single “Źmiej Voziera“, where they play epic “doomish” pagan metal. They literally sound like another band, without female vocals and with an improved sound! If you are into pagan folk metal and melodic blackened metal, Wartha is a band you better check. “Paŭstań” is released by Stygian Crypt Productions in jewel-case edition with 12-page booklet printed in matte paper. It contains all lyrics and is illustrated by Alastor of Scratching Soil. You can visit their official pages below and listen to their music.